Have you heard of the latest trend taking over camping? Glamping.com defines “glamping” as where nature meets luxury. Usually found in an exciting or exotic location anywhere in the world, the accommodations move beyond the basic camping and add a touch of luxuriousness to the experience. 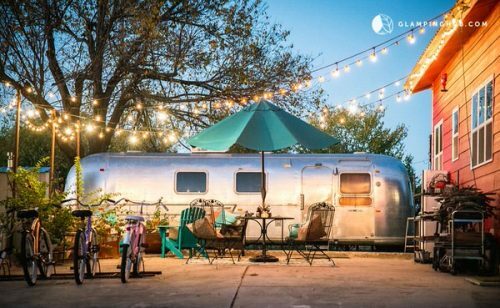 This can be a custom built tree house, a lodge or villa, even a tepee, but since we love Airstreams, we are concentrating on five awesome Airstream glamping experiences that can be found right here in the United States. Our first Airstream glamping experience, nestled in the foothills of the Rocky Mountains in Colorado. 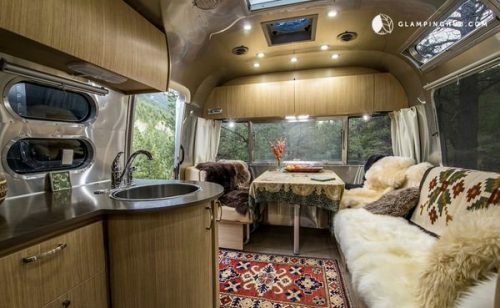 We found this Airstream listed on GlampingHub and it rents for around $175 per night. With all the amenities you would find in a hotel (including breakfast! 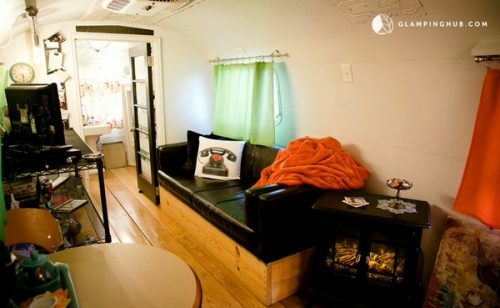 ), this Airstream is a cozy blend of decor that makes us want to head out West. 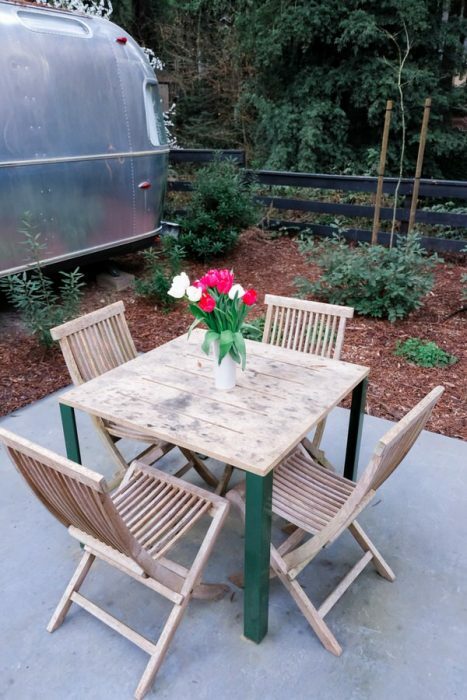 We found this vintage remodeled Airstream on Airbnb. 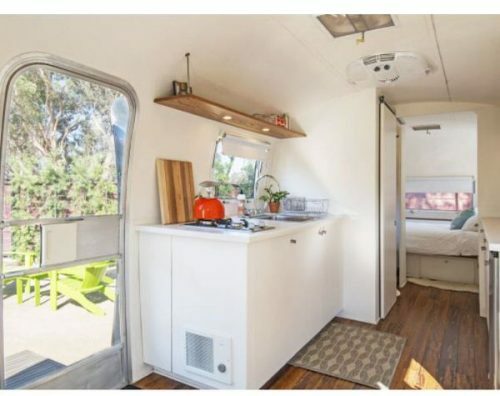 According to the listing, it includes all the comforts of home, with an added view of L.A. For only around $100 a night, this seems like an awesome way to see the city and still be away from it all at the end of the day. We aren’t sure which part of this setup we love more, the interior or the patio! 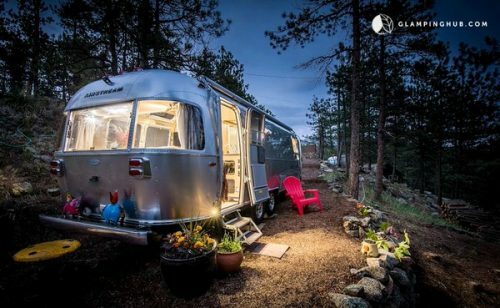 Another great Airstream glamping experience, we found this 1972 Airstream rental on GlampingHub as well. 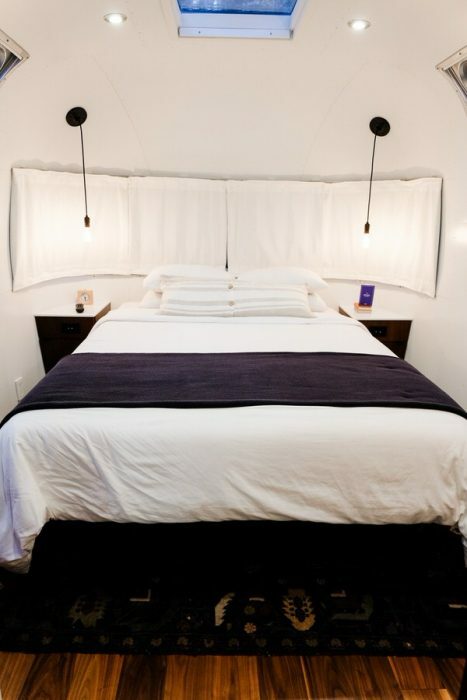 Located in North Texas, the nightly rate is around $117. 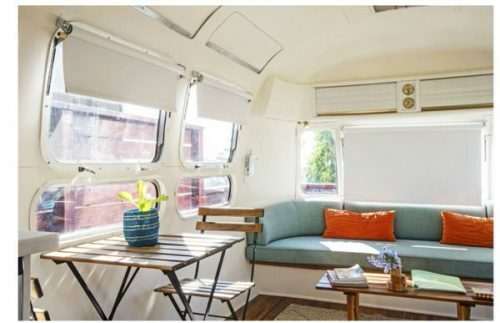 We fell in love with the cozy, retro decor of this vintage Airstream. It even features a bathtub and a fireplace! 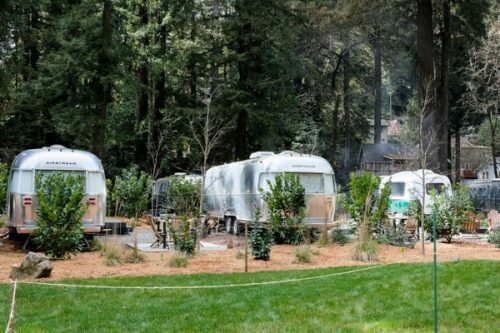 We found this cool campground outside of San Francisco that has turned their entire campground into a glamping experience. According to the article we found at The Sassy Life, its as if you are staying in a mini 5-star hotel (sounds good to us). Rates start at around $170 and going upwards of $600 depending on the size of your party. There are several Airstream trailers scattered around the grounds, each decked out with a modern, simple decor. We love the crisp, clean look of the interiors! 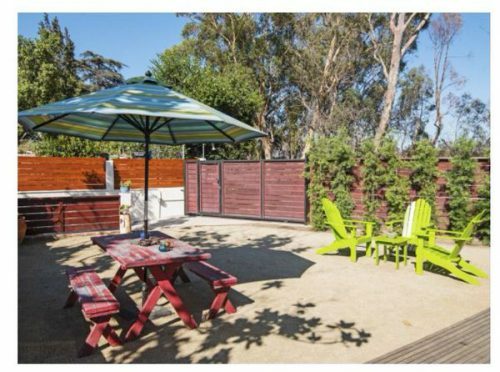 And they all include their own little patio. 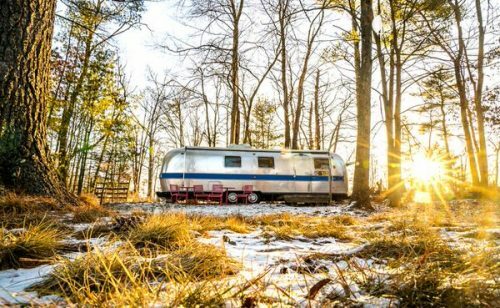 When you think New York, typically the big city lights are the first thing to pop into your head, but with this Airstream glamping experience, you are way back in the country. 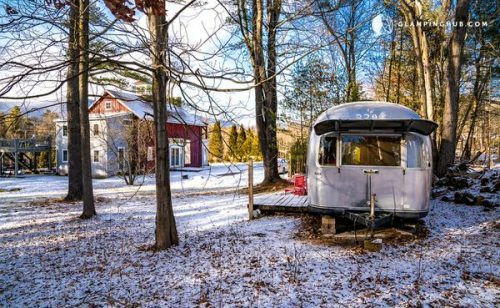 According to GlampingHub, this Airstream is set up along with a bard in upstate New York. 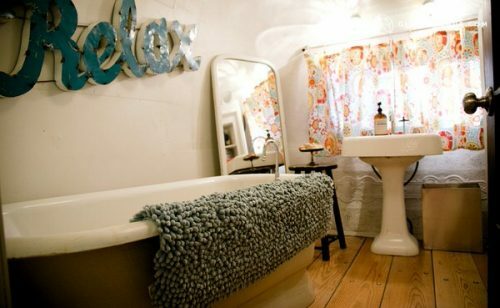 The barn is the main rental, with the Airstream used as overflow or if you want a little privacy away from the group. Definitely more pricey than our other settings, at over $1400 per night, our first thought is it would be ideal for a small family reunion or a work retreat. 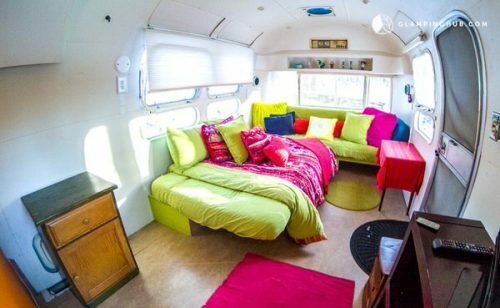 The Airstream features a super bright and colorful decor and is nestled right beside the main lodging. We love the view as well! It looks like glamping is here to stay. 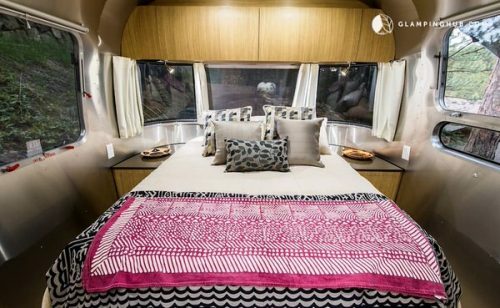 While researching this Airstream glamping article, we noticed tons of sites offering everything from Airstreams, tree houses, vintage campers and everything in between. We have even featured a couple of the campgrounds that offer Airstream rentals such as Daydreaming of Kate’s Lazy Desert Airstream Motel. All in rustic or exotic settings with most amenities included. What do you think? Looks to us like a great way to enjoy nature without actually having to rough it! I think this is a great idea for any old trailers. Bring em back.